In this ceremony Shri Jai Kumar – Regional Provident Fund Commissioner (C.G.) facilitates their gracious presence as Chief Guest and Mr.Dhanesh Yadav, Vice President – Janpad Dharsiwa, Smt.Pushpa Banjare-Zila Panchayat, Smt. Savita Chandrakar –Zila Panchayat, Mr.Bhushan Ekka –T.I. Dharsiwa as guest of honour. On the Dais Mr.Abhishek Agrawal, Executive Director of Godawari Power & Ispat Limited, Mr.Vivek Agrawal-Chief Operating Officer, Smt.Neera Mishra, Mr.Vinay Shandilya, Mr.Raveendra, Mr.Rahul Karwal also present. With the arrival of the chief guest, Mr. Jay Kumar a floral tribute was paid to the departed soul of Dr.S. K. Mishra. After that Mr. Jay Kumar, Mrs. Neera Mishra, Mr.Abhishek Agrawal along with all guests had a shake hands with all 48 Sarpanch and captains. Mr. Abhishek Agrawal in his welcome speech took the opportunity to praise Mr. S. K. Mishra and announce that the journey of Gram Panchayat cricket tournament which was conceptualised by Late. Dr. S. K. Mishra in the name of MILAAP will continue in future too. 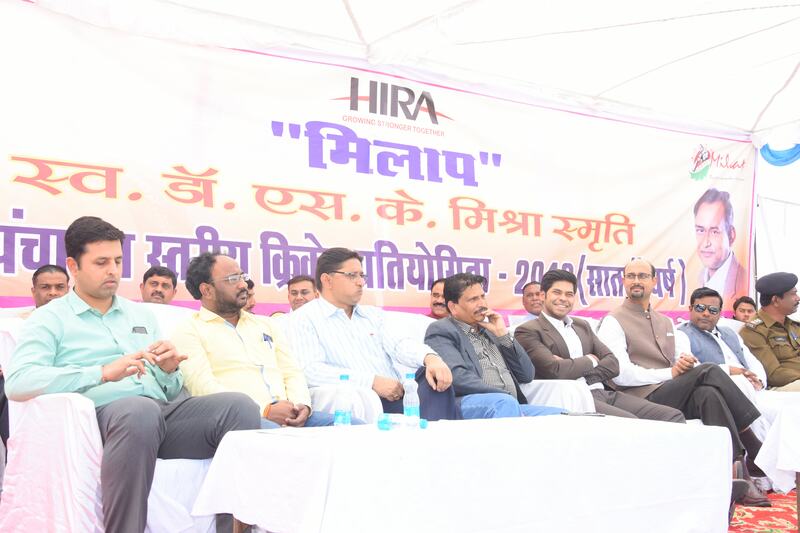 Mr. Jay Kumar in his speech appreciated Late Dr. S. K. Mishra for taking the initiative to bring out the concepts of CSR from the closed doors of the office to the ground in the form of gram Panchayat level cricket tournament. He also praised the Managing Director of GPIL Mr. B. L. Agrawal to support this vision to be a mission. He compared this effort of GPIL with that of Tata Iron Steel, Jamshedpur. Mr. Vivek Agrawal, the COO of GPIL, on this occasion repeated the exclusive prize to be given to the best player of the tournament which is a secure job in GPIL. Balloons were released to officially begin the cricket tournament by the chief guest in the presence of Mr. Abhishek Agrawal, Mr. Vivek Agrawal and others. The opening ceremony turned out to be a success by the team of GPIL under the guidance of Mr. Mansoor Ali Ahmed.